While gathering data for our Prague local search site, we took photos of over 8,000 businesses in Prague. Thus, we just happen to have photos of the restaurant that occupied the space that Starbucks Coffee in Prague took over to launch its first location in the Czech Republic. Say what you will about Starbucks, but I think this renovation is a change for the better. 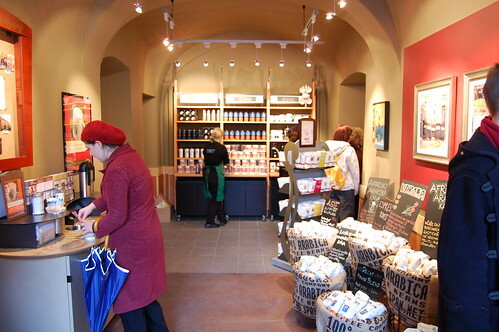 Lots more photos of the new Starbucks in Prague can be found on Flickr. Danish version of Nelso for Mobile is up at http://m.nelso.dk. I stopped by the new Prague Starbucks on the way home from a meeting today. Almost identical to a U.S. Starbucks, with prices to match. I paid 115 CZK for a White Chocolate Mocha ($6.35), which is a little out of my price range for a cup of coffee. It wasn't as crowded as I thought it might be, considering today was the first day of operations. Certainly bustling, but no trouble to get served at the counter or find a table. However, that might change as we get closer to tourist season. I can imagine this location being unbearable on a July afternoon. Eighteen more photos of Starbucks Prague can be found on my Flickr account. I just now launched a mobile version of Nelso in Czech. You can find it at http://m.nelso.cz. Next up: Danish. According to this press release from Starbucks, the company's initial Prague location will open on Tuesday, January 22, 2008. This is the first time I've seen a hard date for the opening. I'm tempted to drop by on Tuesday, but I wonder if it will be as packed as the first McDonald's in Prague was when it opened in the early 1990's. Back then, the opening of a McDonald's in Prague was a real event, a symbol of all the things from the West that Czechs had been denied under 40 years of communism. Now that you buy just about anything in Prague, will people line up around the block to buy high-priced coffee served in paper cups? Whatley at SMS Text News has written a good post about naming conventions for mobile sites. He comes down on the '.m' side, meaning his preferred convention is that you replace the 'www' in any URL with 'm' to get the mobile version of a website (e.g. www.yahoo.com becomes m.yahoo.com if you are looking for mobile content). I have to agree, and this is exactly what I did with the Nelso mobile site. The other popular option is to use the '.mobi' top level domain, and give your site an URL like www.yahoo.mobi. This is a poor solution for a number of reasons, but one of the biggest objections I have is that it assumes that a website has only one mobile version. What to do about sites like Nelso that have content in many languages, and use country-level domains for this content? Where does the Czech user go to access our mobile content? I guess you could send him or her to the .mobi site, and then present a splash screen to choose language and location, but that feels a lot clumsier than just using a domain like m.nelso.cz for the Czech mobile site. I'm going to stick with the '.m' naming convention. It'd be great if this convention became universal, and I could count on the Flickr mobile site being at http://m.flickr.com (it is, by the way). Having a TLD like '.mobi' makes no real sense. Should I offer FTP access to Nelso at www.nelso.ftp? I think subdomains will work fine. Greg Sterling writes about some recent research on local online ad spending. JupiterResearch seems to have the most conservative estimates, forecasting the market for local search advertising (the business I'm in) will be $2.5bn in 2012 (U.S. only). Some of this will come from additional advertisers spending ad dollars on local search, but a portion might also come from higher keyword prices for local search. I have a good idea what kind of keyword prices a site like CitySearch is getting in the U.S., and I'm keen to find out what a Czech user is worth compared to a U.S. user. I'm not currently running ads on the site, but as I'm getting most of my traffic on the Czech-language pages of Nelso currently, these keyword prices will have a lot of influence on whether I can make money running a local search site for Prague. I'm jumping the gun here, but I thought I might as well add the new Starbucks Coffee in Prague to the Nelso.com database a few days before it actually opens. 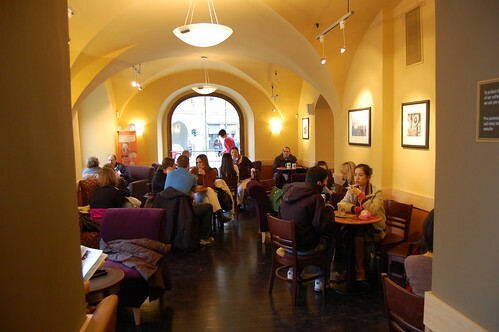 The new Starbucks will be located in the space that used to house Square (part of the Kampa Group). What do you call a drugstore that doesn't sell drugs? I've been having a little translation problem on the site concerning how to translate "drogerie" from Czech into English. I would like to translate it as "drugstore", but that won't quite work, as it will confuse Americans. The problem is this: in the Czech Republic, only a pharmacy is allowed to sell drugs. And I don't mean just prescription drugs - I mean basically anything that you can put in or on your body that is supposed to have some kind of therapeutic effect. So, in addition to prescription drugs, you have to go to a pharmacy to buy cough syrup, aspirin, or even vitamins. Pharmacies have a monopoly, and like all good monopolists they don't worry too much about their customers. The pharmacies in my neighborhood of Petřiny all close at latest at 7PM. In the U.S., I could pop into the nearest supermarket for some cough syrup at 1AM, but not in Prague. You're advised to get sick only during office hours. In American English, I'd expect "drugstore" to mean a place where I can buy cosmetics, some food items, greeting cards, toothpaste, shampoo, etc. But I'd also expect to be able to buy ibuprofen, vitamins, cough syrup, and other OTC medicines. But a Czech "drogerie" is an American drugstore without the drugs. So they have pantyhose, shampoo, candy, magazines, toothpaste, and cosmetics, but they can't sell you something as simple as aspirin. If I translate "drogerie" as "drugstore", I'll annoy a lot of my American users that go looking for Tylenol in a "drogerie" after a long night sampling Czech beers in one Prague's many pubs. So, the question remains: what do you call a drugstore that doesn't sell drugs? According to an article in the Telegraph, a 14-year old boy in Łódź, Poland used an IR transmitter to control the direction of trams in his city, causing at least one tram to derail, injuring 12. When a tram driver in Poland comes to an intersection, the direction in which he travels is controlled by a simple infrared signal, the same system used in a TV remote control. It's a little scary that by simply programming a universal TV remote control (or using any PDA that has programmable IR capability) that you can control all the trams in a city like Łódź. I ride the tram (streetcar) here in Prague nearly every day (and so do my kids), and I'd hate to think that a kid with a Palm Pilot can derail the trains at will. My local search site for Prague has gotten to the stage that it's probably time to start blogging again (I had a pretty good blog for my last start-up). I don't think I'll have any trouble coming up with ideas; it'll be finding the time to write that will be the problem.